Last month, Swiss scientists said they had detected high levels of radioactive polonium but could not say if it had caused his death. A French inquiry is also said to have found he was not a victim of poisoning. Yasser Arafat fell ill after eating a meal in his compound in Ramallah and weeks later was admitted to hospital in France, where he died. He was diagnosed with a serious blood disorder and died of a stroke on 8 November 2004. But no post mortem examination was carried out as his widow Suha did not ask for one. When in 2012 an investigation by al-Jazeera TV in conjunction with Swiss analysts in Lausanne found abnormal levels of polonium-210 on his personal effects, Suha Arafat called for her late husband's body to be exhumed. France then launched a formal murder inquiry. The Vaudois University Hospital Centre (CHUV) in Lausanne reported its findings last month, on the ninth anniversary of his death, saying its results "offer moderate backing for the theory of poisoning". But a leaked report of Russia's initial tests on the same day said high radioactive penetration was "unsubstantiated". Weeks later, a source said the French report had ruled out the poisoning theory, and pointed towards a natural death. Announcing its conclusions on Thursday, the head of Russia's Federal Medical-Biological Agency (FMBA), Vladimir Uiba, said "Yasser Arafat died not from the effects of radiation but of natural causes". The agency had completed its work, he said, and there was general agreement with its findings. "Even the Swiss withdrew their statements and agreed with us, and the French confirmed our conclusions," Mr Uiba was quoted as saying by Interfax. However, Francois Bochud, the head of the Lausanne institute that carried out the parallel Swiss inquiry, told AFP news agency the Russian findings had no scientific foundation. "The Russians are putting things forward without giving the slightest numerical value, without the slightest scientific argument. So for me it's empty - a political statement." Palestinian ambassador to Moscow Faed Mustafa said investigations into the former Palestinian Authority president's death would go on. "We respect their position and we highly value their work, but there is a decision to continue work," he said according to Russia's Ria Novosti. Many senior Palestinian officials have blamed Israel for the death, although Israel has strenuously denied having anything to do with it. 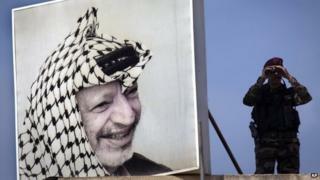 Yasser Arafat's widow told the BBC last month that her husband had "a lot of enemies" but she could not accuse anybody or jump to conclusions.